Box Dimensions (LxWxH) 7.0 x 6.2 x 6.0"
LCJ-RXE Premium Jacket Case for Cyber-shot DSC-RX10 Camera (Black) is rated 4.2 out of 5 by 16. Rated 4 out of 5 by Thoughtful5 from Basic protection It kept the camera dry during significant rain. It's easy to get it off fast. I liked its place to keep an extra photo card, and it would have been nice for a spot for an extra battery and to keep the lens cap, which has no means to attach to the camera body, from being a nuisance in a quick shot situation. This jacket case is basically for protection only, and it does that. Came as part of the set and it is helpfully not too large. The strap loudly proclaims the model, which is only a problem in that it might attract thieves who know models, but I can yell loudly. Rated 2 out of 5 by AcademicWithCats from Not the leather pants you want to rock Conceptually a cool idea. Classic form-fitting leather sleeve. Except this is not that. This is rather bulky and completely in the way when not on the camera. Rated 5 out of 5 by Wilhelmina from Fits Beautifuly I love this case for my Sony DSC RX10 because it provides me with the security I want for my camera. It looks and feels good. I wondered what I was going to do with the case when I was shooting with the camera. I realized that I could snap it on my belt loop until I was finished. Of course you can put it in a camera bag. I also bought the Sony Premium Genuine Leather Strap (STPXH70B) for the camera. It was just the right size for the camera and case. Neither was cheap but they will last a very long time. Rated 4 out of 5 by banjoman from Does the job Rather overpriced. At this price it should be made from leather. It does a good job of protecting the camera. But not very good trying to use the camera. You almost have to remove the camera otherwise the case hangs rather awkwardly on the camera. Rated 4 out of 5 by Cedar Mountain Man from Great protection for the RX10 Product quality is good and fits well. I was looking for good protection in as small a size as possible and this fit my need exactly. Only downside was the cost compared to other options (though none that fit this well). Rated 4 out of 5 by Derek E. from Very good Addition to the Camera This a very nice case. At first it may seem a little expensive for the non-leather material, but it is fairly well constructed and fits the camera well. There is cushion on the inside in some areas that further protects the camera and openings that allow the use of a shoulder strap, which is not included. 4 stars due to price. Rated 5 out of 5 by Dance & Theater Photographer from Fits perfectly!! Case keeps camera safe in your purse or bag without adding extra bulk. I like this since I like to carry as little as possible and I am more apt to always have my camera with me. Rated 5 out of 5 by Ralph from High quality, compact This camera jacket allows you to protect the camera without having to carry it in a bulky bag. Throw an extra battery in your pocket and you've got everything you need. Hi, Does this fit the Sony RX10 III? Thank you. Would you please recomend a neck strap to buy for this case. 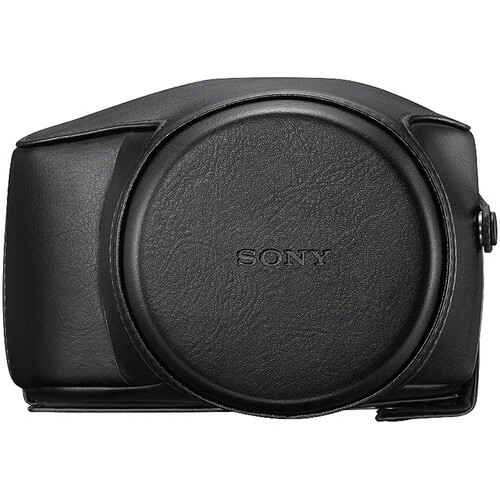 The Sony LCJ-RXE Premium Jacket Case for Cyber-shot DSC-RX10 Camera (Black) does not attach to a camera strap. The design of the case uses the strap attached to the camera. The Cyber-shot DSC-RX10 comes with a camera strap. Will this case work for Sony RX10 IV? No it will not. But the LCJ-RXJ will work with the RX10 IV.